Stagecoach North Scotland will use the smart electric-hybrid double-deckers on their 35 service between Aberdeen, Banff and Elgin. The environmentally friendly vehicles will be based at the company’s Macduff depot and come as part of a multi-million-pound investment by the firm. It is hoped they will reduce CO2 and NOx emissions in the region when they get on the road in April. 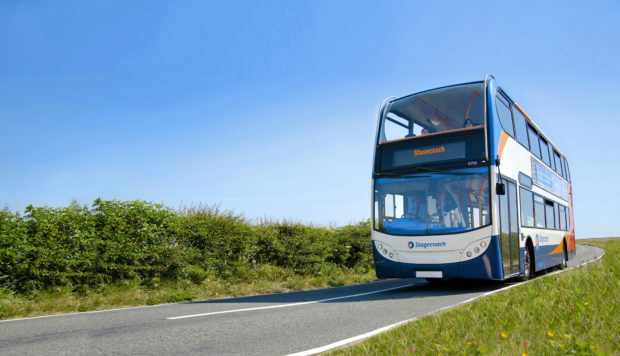 Stagecoach said the additions to their bus fleet will offer passengers low floors for easy accessibility, leather seats, free wi-fi, USB charging points and contactless facilities. Passengers will also be able to track the vehicles by using the company’s mobile phone app. The buses have an onboard system called GreenRoad to provide drivers with instant feedback on their driving to improve and promote fuel-efficiency. Stagecoach’s Macduff depot has previously won the Christopher Ball Memorial Award, which recognises efforts to drive economically. The hybrid buses will replace the current fleet used on the route and will boost space for passengers by almost 50 per cent. David Liston, managing director for Stagecoach North Scotland, said the firm was “thrilled” to be able to offer an improved service. He said the changes will boost punctuality for passengers and as well as cutting down the environmental impact of east-coast travel. Mr Liston said: “We are absolutely thrilled to be introducing even more new buses for the communities in Aberdeenshire and Moray. “We know that service 35 is a vital service for the communities we connect and our new fleet will not only reduce the impact of the bus on the environment but they will also allow us to improve our punctuality for customers. Stagecoach’s Service 35 connects more than 15 towns in Aberdeenshire and Moray to both Elgin and Aberdeen. The Macduff depot employs 50 drivers who operate a fleet of 27 buses on various routes between Elgin and Aberdeen.